While persuing trips for next summer this weekend, the Mrs. reminded me of her long-time wish to visit the Shetlands�and the Outer Hebrides. On Harris, we found this great place - Blue Reef Cottages.�It looks like Norway. 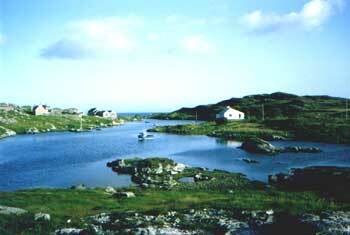 Here's Visit the Hebrides. Here's a photo gallery of Harris, the home of Harris Tweed, natch. Nearby, the Dunollie Hotel on Skye looks good. In the Highlands, we'd chose the Tulloch Castle Hotel. I love the way they say in the UK:�"Pets welcome. No extra charge." Beautiful--but looks colder'n a well-digger's behind. Interesting your Mrs. and I are on the same page this year. I recently found this website to help with the planning. bus/car to Hanstholm ferry direct to T�rshavn in the Faeroe. Then ferries down to Hebrides, and continue south. Quick hop by ferry from Scotland back to CPH for the return flight. Or, one could . . . .
Who's afraid of a little cool air? It's God's air conditioning. BD you could also return home by heading west out of Scotland--ferry to Iceland--Icelandair to US. If we all send a demand letter for you to report back to us what it is like up there, will that make the trip a tax deduction for you? We have snow on the Puget Sound tonight. aww, ap, can't take credit--''witches t*t in a brass brassiere'' is an old 'it's cold as' local expression. If you make it down to the Sound of Mull, there is an inn off of Loch Aline which specializes in local cuisine at Ardtornish House. Actually more like seafood, i.e. scallops and salmon etc. Haggis is more seasonal and less haute cuisine.